I could tell you for hours about the beauty of England. I could write everything about the unique Big Ben and the indescribable majesty of Buckingham Palace. I could describe to you every detail of the London Eye as no one has ever described it, but I won’t. I won’t write about things that can be seen with naked eye. I won’t write about things that everyone knows because they are not so important. There are more important things than these, things such as people. Yes, people. 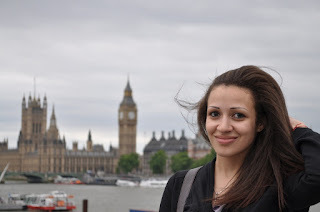 I want to write about people who radically changed my life for short time I have been in London. People who I will never forget and I will always remember with a smile on my face. I have been living in London for one month. In this short time I have changed a lot. I came to England with my boyfriend and initially we were very skeptical about staying here. Everyone was talking about the dark and rainy London and dingy English people and foreigners, but it was not true at all. We learned that the moment we stepped onto Heathrow Terminal 4. Everyone was so busy and excited that I could not even realize what was happening around us. At first I thought: "Oh my God, where are we?" but after a few brief seconds I realized that whatever I do at the airport no one would notice. I could go ahead, laugh and sing out loud to myself. And again - no one would notice. I could do everything that I wanted and no one would stop me or laugh at me. I could be myself. You can be yourself in London. I could be free and I liked that a lot. Having started my English language courses at Twin, people in England surprised me more and more. Each of them was so different and unique that I noticed this the very first day I came here. I noticed that the English people and foreigners were so different from each other, but all of them were smiling. I had never seen so much smiling people in one place, and every one of them was ready to help me in every issue. When I got lost in North Greenwich I was impressed that an Englishman came and helped me without me even asking for help. This surprised me and amazed me. Why are people all around the world not more like this? Like I said, in one short month I’ve changed a lot, especially in Twin when I saw with my own eyes how amazing people were. In Twin everything is perfect; from the amazing activities that Twin organizes for us to the International lunches with amazing and incredible food, or the smiling administrators on the first floor to the teachers who are laughing all the time and whom I love very much. One day in class where we were prepare a certificate for one of the employees of Twin - Lena, who left for home. The certificate was about escaping the Twin mental house and the lunatics in it. We couldn’t stop laughing all the time we were making it. Yes, everything and everyone in Twin are crazy but here I’d learned English three times more than I’d leaned back home. In Twin we are learning while we are having fun and we are laughing. There is nothing better than this, right? Finally I want to say something about my whole class. Each of us is different but I could call each of them my friend. Together we are laughing all the time, we are having fun and we are learning. 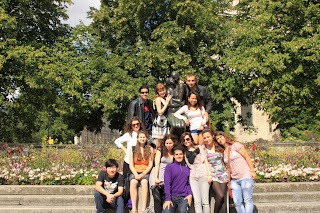 We are going together every month to the center of London and experiencing many things. One thing is certain however - when I complete the course I will miss all of them (especially Mariola - our teacher) and I will never forget them. It is not important who are we - it is important what we do. It doesn’t matter if you are from Georgia, Italy, Poland or Brazil. It matters what we are doing and what we want to achieve in our lives. And here in England is full of many people who are doing many good things. That is why I love this city and this country so much. Because of the people – we are unique.